The awards were announced last night as part of the CAPA Annual Council Meeting in Perth. 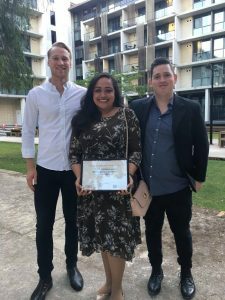 The awards are a new initiative this year and there are 5 categories: Education Initiative of the Year, Welfare Initiative of the Year, Aboriginal and Torres Strait Islander Engagement Initiative of the Year (awarded by NATSIPA), and CAPA Citizen of the Year. 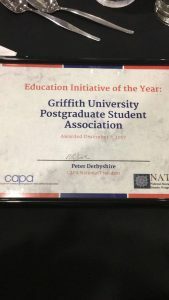 GUPSA’s editing service was nominated for the Education Initiative of the Year. We at GUPSA are very proud of the editing service. It was first established back in the early 90s and continued through to 2006 and VSU when GUPSA and many other student organisations lost funding. Once funding was resumed in 2013, we made it a priority to restore the service and were able to appoint Evie Franzidis as our first editor in residence. Demand for the service grew rapidly so that in mid-2014 we appointed Maureen Butler as our second editor in residence. Last year, Leanne McKnoulty joined the team bringing her expertise and experience in the sciences to enable a service that can meet the particular needs of students in all disciplines. Congratulations to our editors in residence team and thank you for the support you provide to postgraduate students in Brisbane and Logan.